People who live in or visit Arizona can expect to see many species of wildlife. More and more often though, wild animals are venturing into areas where people live. Sometimes the wildlife becomes a problem, either by hammering on the side of the house, digging a den under the front porch, or eating all of your brand new landscaping plants. You can usually enjoy wildlife watching from a distance, but sometimes wildlife encounters involve conflict. Preventing problems with wildlife is much simpler and less aggravating than dealing with the problems after they occur. Fortunately, taking a few simple steps can help you prevent many of the most common wildlife-related problems around your home. A number of proven methods can be used to solve the problem when it cannot be prevented. 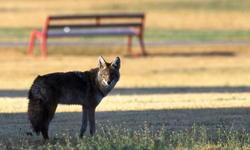 These web pages were developed to provide residents of Arizona with information about how to coexist with Arizona’s wildlife, especially in urban areas. Learn how to identify and live with mountain lions, bobcats, coyotes, javelina, bears, bats, woodpeckers, and raptors.